The Communard Government is in place. The workers control the industry, and the Commune's government, made up of representatives from unions all over France, is there to protect the workers and peasants. 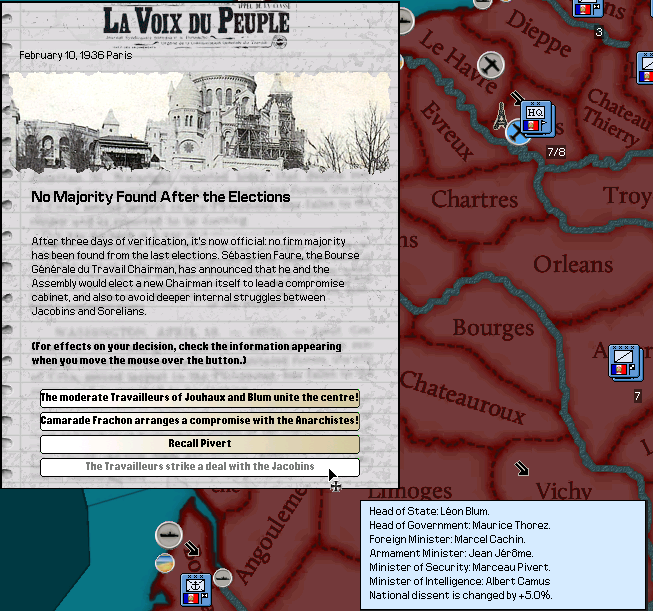 The Commune has controlled France for 16 years as of 1936. French Society has changed drastically, and for the better. Bourgeois culture no longer dominates France. 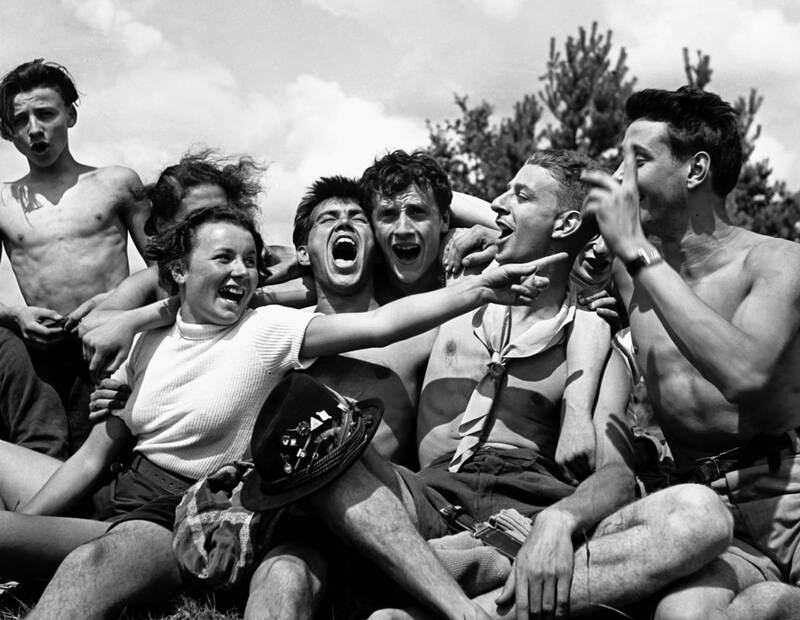 The Youth are free, happy, and active. The Youth and the Working Class also educate themselves in things like philosophy, history, science. The populace now can read and understand the theories of Socialism. The Working Class is now active in politics, being able to easily get elected into the local or national government. 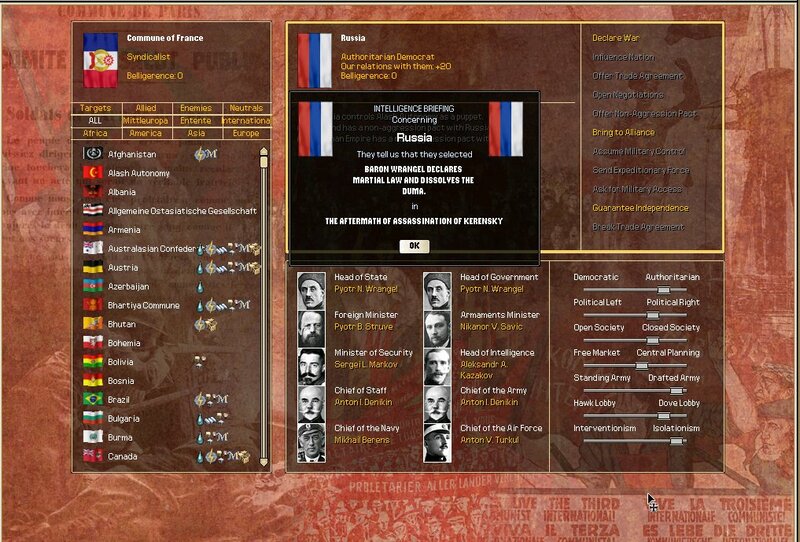 Even though the Revolution of the Soviets was crushed by the White Movement in 1920, their martyred revolution inspired the CGT, the Jacobins and the rest of the United Front to finally destroy the forces of Counter-Revolution in France, leading to the Bourgeois and Reactionary flight to North Africa. 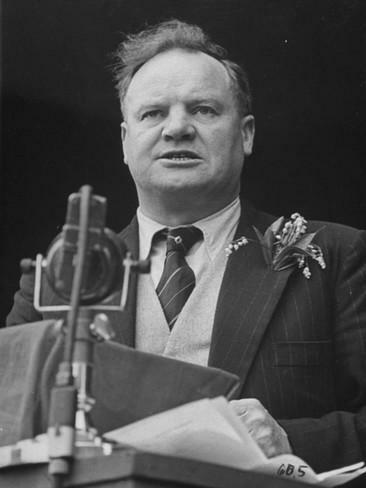 The Sorelian strongman, Georges Valois was invited by Oswald Mosley of the Union of Britain to Birmingham. It seems that may be looking to form some sort of agreement or pact in order to unite their forms of socialism. In response to the aftermath of the assassination of long-term but unpopular Russian President Alexander Kerensky, the famous Black Baron, Pyotr Wrangel, has declared Martial Law in Russia. 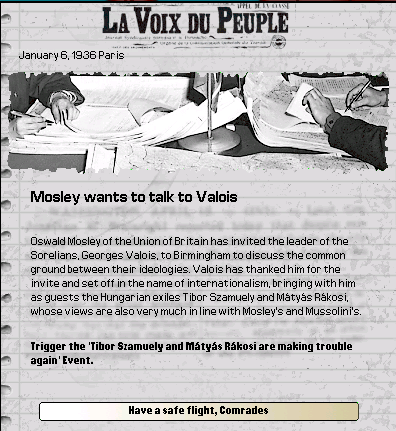 Kerensky's assassin's motives will be forever unknown, as he was shot down by Kerensky's bodyguards. 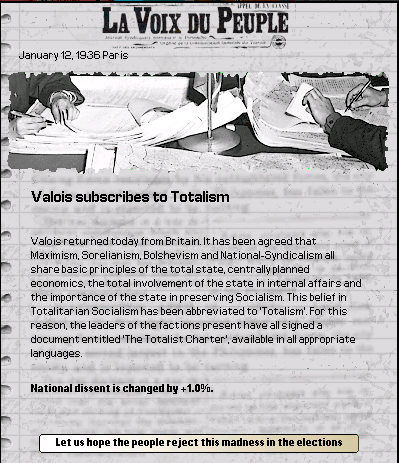 Valois has returned to the Commune with the ideology "Totalism" Mosley, Valois, Mussolini, and even the Georgian Beria have adopted Totalism as their distinct form of Socialism. Many have begun to call the Bolshevik-inspired Jacobins "Totalists" as well, much to the ire of the Jacobins themselves, who label the Sorelians as "Counter-revolutionary traitors to the Commune" and vice versa. 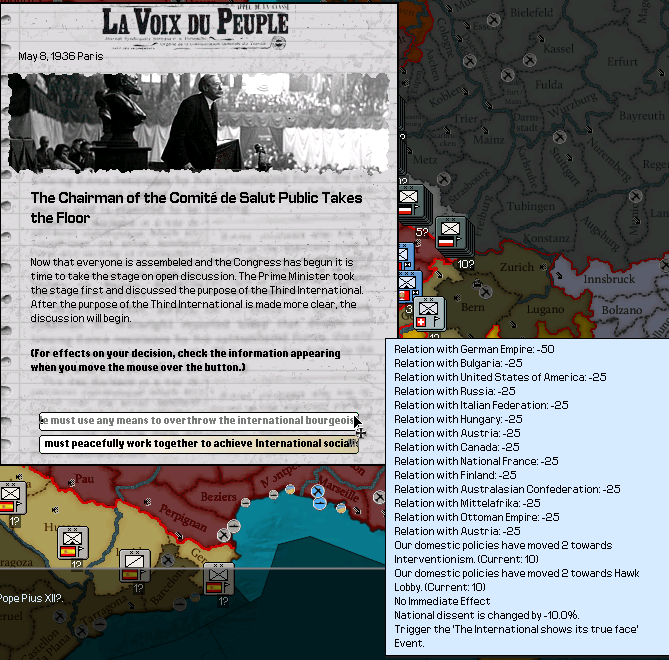 The Commune is not immune to political troubles. President of the Committee of Public Safety, Marceau Pivert, has been deposed by the BGT. 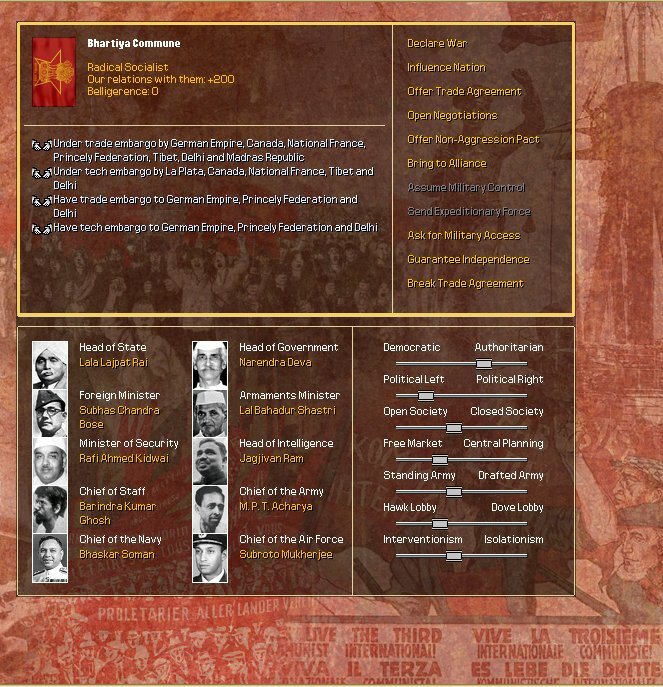 The upcoming elections will have a drastic effect on the Communard government. 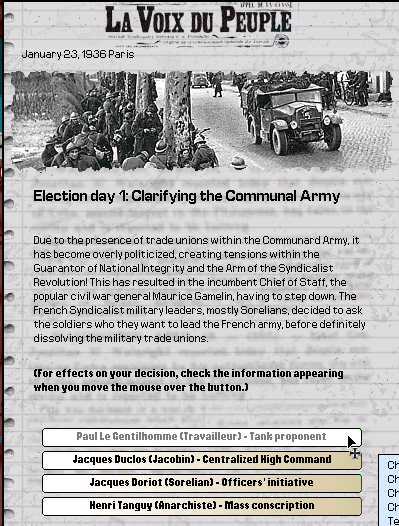 Not long after, the Communard elections begin.. The unpopular and controversial presence of trade unions in the Communard Military has led to the (still popular) General Maurice Gamelin to step up. 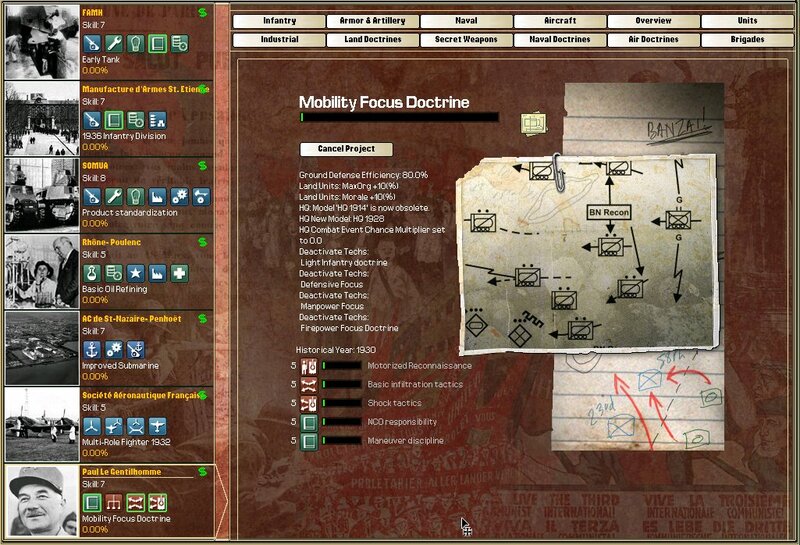 Although just barely winning, Paul Le Gentilhomme, a famed theorist on mobile armored warfare, has been elected. 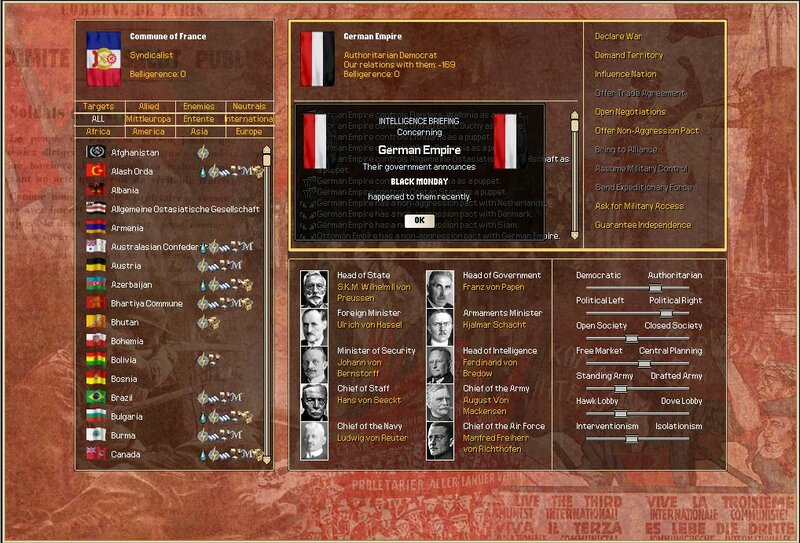 The Sorelian candidate, General Doriot, came in second. The very important (and very underfunded) Committee of General Information is a highly sought-over tool. 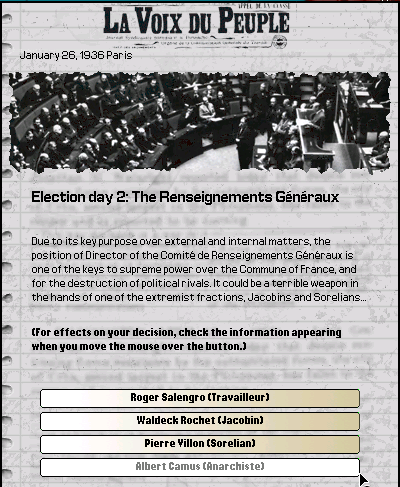 The young, 23 year old member of the Anarchistes, Albert Camus, has won the position as Director of the Committee of General Information. Although no longer President of the CSP, Marceau Pivert has not given up yet. 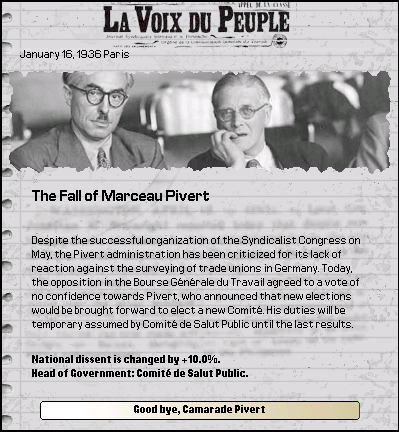 Pivert has been endorsed by the Travailleurs faction, and he was able to come out ahead just slightly above the Jacobin Maurice Thorez. 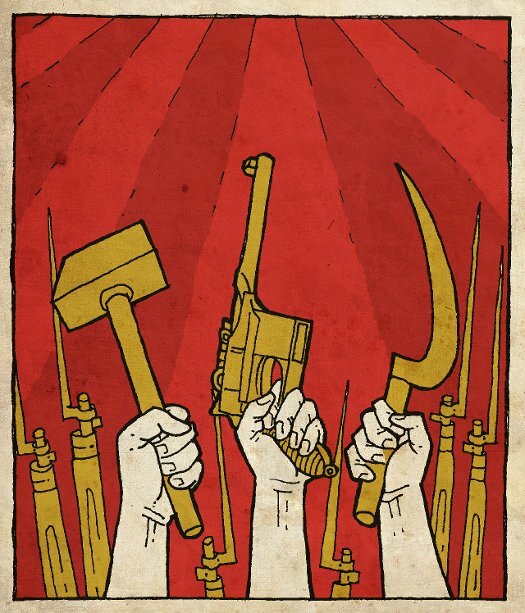 Another very important aspect of the Commune, the economy. 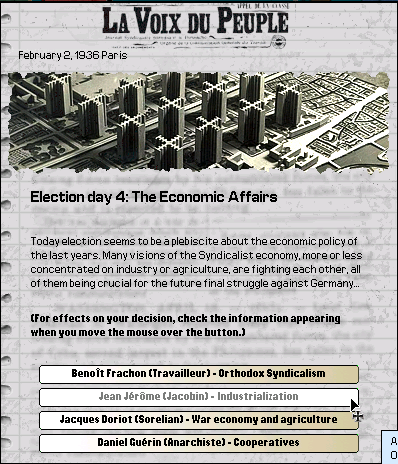 Sorelian General Jacques Doriot, not gaining his position as Chief of General Staff, has instead decided to run as Delegate to Economic Affairs on a campaign of a war economy and increased agrarianism. This however, is not popular. Jean Jérôme (born Michał Feintuch) of the Jacobins, campaigning for an increase in Industrialization, who won with the eventual backing of the Travailleurs. Meanwhile in Capitalist Europe, the Berlin Stock Exchange has crashed. All across Europe, people are losing their jobs and inflation is rising. 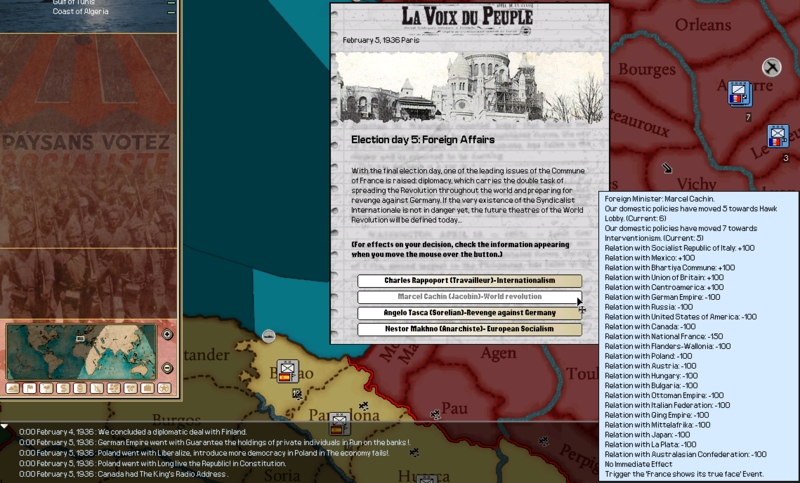 The Jacobins come out with another victory in the elections. 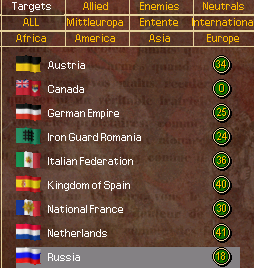 A high-ranking Jacobin, Marcel Cachin has won the support of many radicals in the Commune, as he wishes for 'the Red Flag of Socialism to fly across the entire world'. The elections have ended; but with no majority. 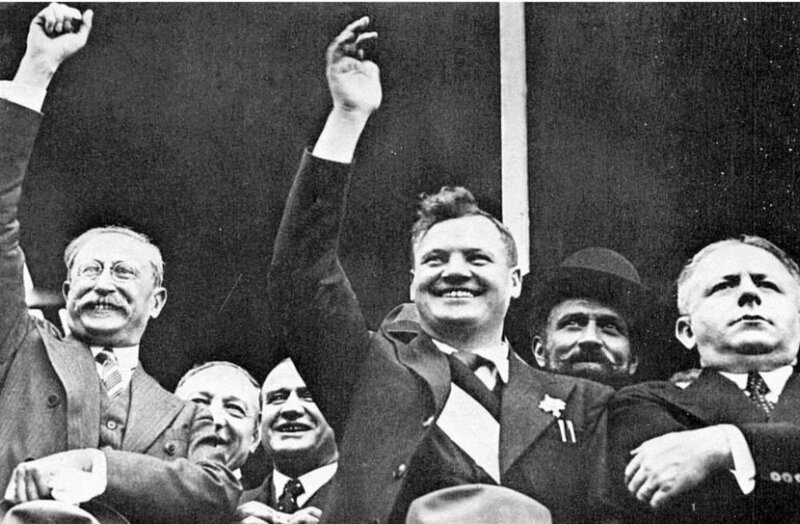 Travailleur moderate Blum and popular Jacobin Thorez have been chosen to lead a compromise cabinet, dubbed the "Front populaire"
Blum (left) and Thorez (right with hand raised) are both quite popular and have promised to lead France into a bright future. The Sorelians, opposed to the Jacobins, are not happy. 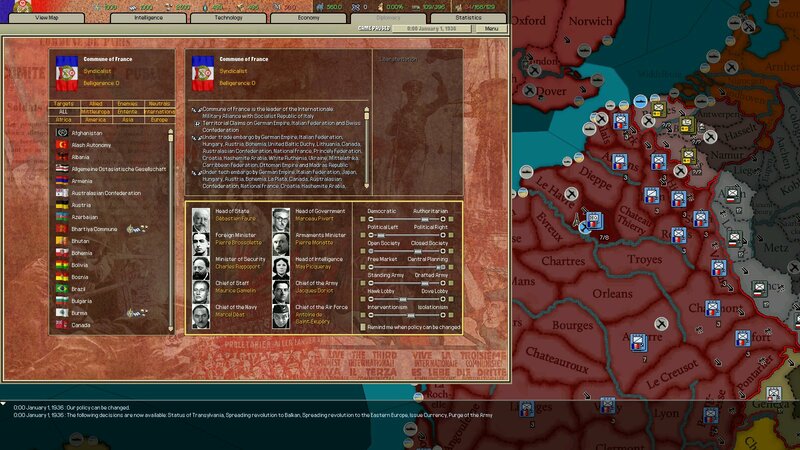 The Jacobins, on the other hand, are quite happy. 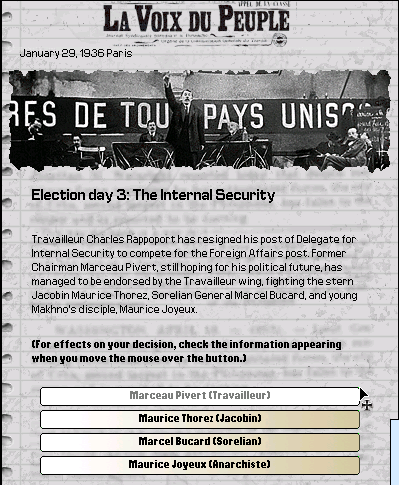 As President of the Committee of Public Safety, Maurice Thorez is in a position of considerable power and can definitely influence the Commune into a Jacobin position. 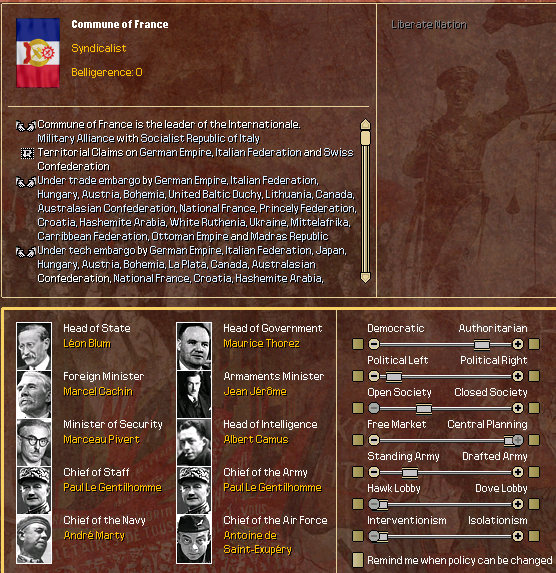 The government of the Commune is now rearranged. The Popular Front, like its name implies, is quite popular with most of the country. 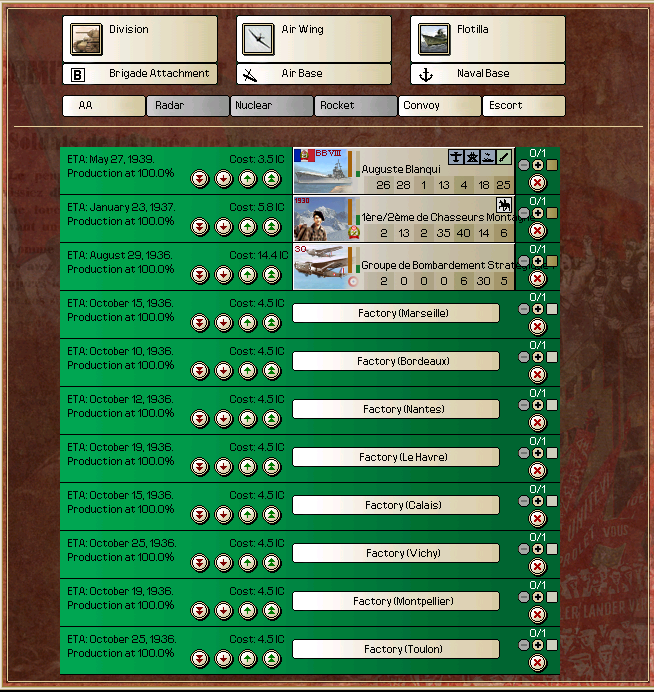 With the Communard government in order, focus shifts towards the development of new technology. Most notably, General Le Gentilhomme's work on armoured warfare and mobility. 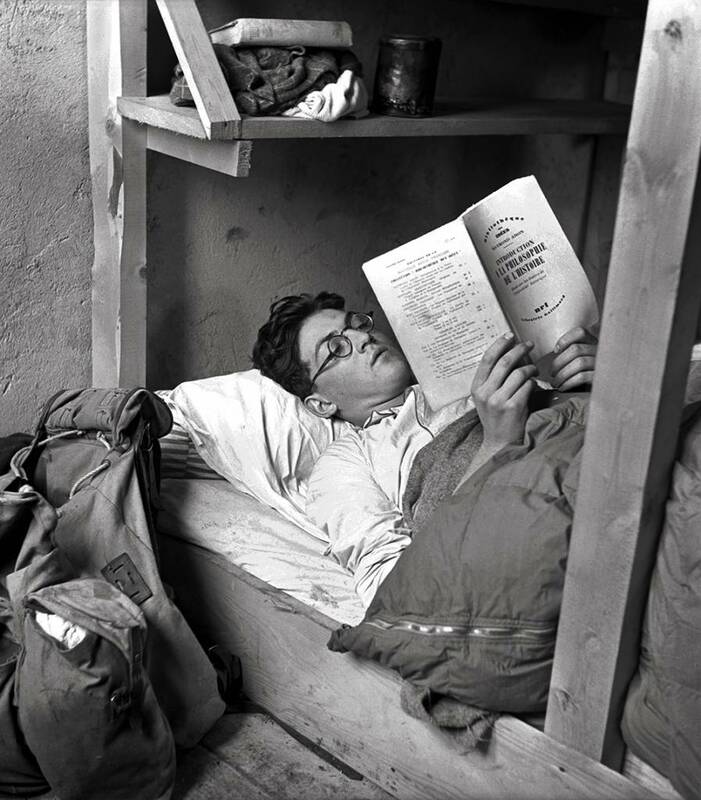 Now that General Information has proper funding, Albert Camus, went hard at work on securing agents and networks in states that pose a threat to the security of the Commune, which is to say, most of Europe. 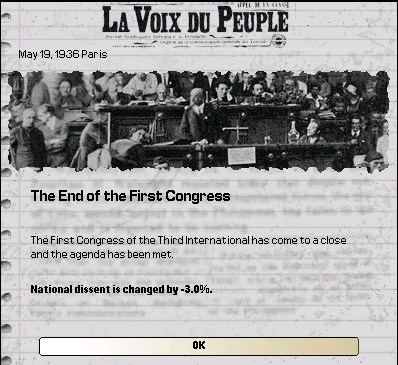 The First Congress of the Third International has been long in the making. All of the world's parties devoted to Socialism shall attend in Paris to discuss the course socialists shall take. 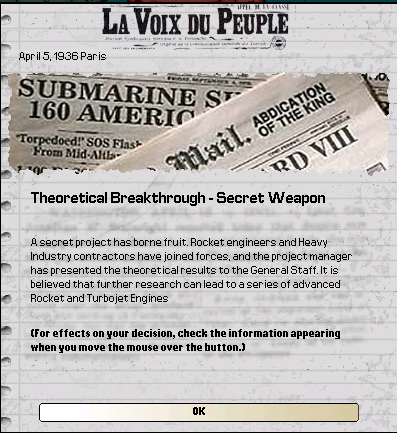 Communard scientists have presented information to Le Gentilhomme, declaring that further research into this can result in powerful weapons. No doubt, Le Gentilhomme will keep an eye on it. 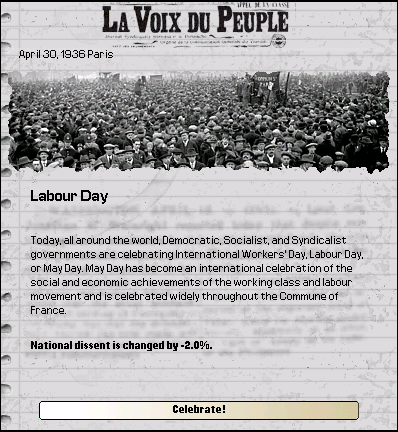 Another May Day in the Commune. Millions gather in the streets of France, all celebrating International Workers' Day. At the same time, there are also anti-Communard protests. The Anti-Communard protesters are not arrested, but their actions will be known to the government. 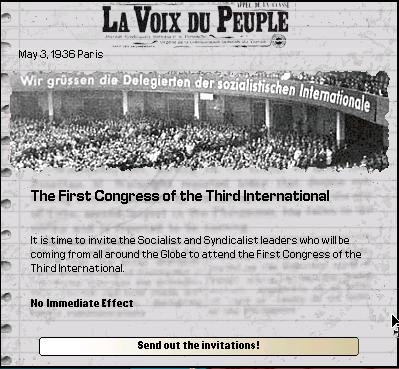 On May 7, a few days after the official invitations were sent out, all of the worlds' Socialists have gathered in Paris. Figures like Philip Snowden and Oswald Mosley of Britain, Antonio Gramsci and Benito Mussolini of Italy, Nikolai Bukharin and Mikhail Frunze of Russia, and Ernst Thälmann and Kurt Eisner of Germany. "We must use any means to overthrow the international bourgeoisie!" This statement led to a roaring applause, every delegate standing up to cheer the statement. 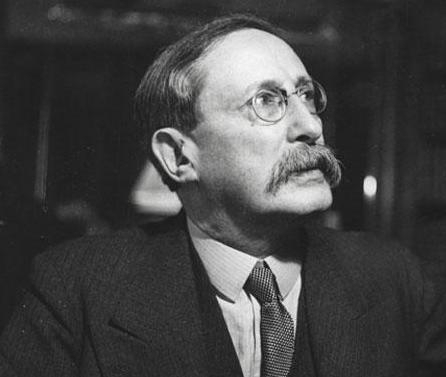 After Thorez's speech, President Léon Blum took the stage, and gave a rousing speech of his own. Blum spoke of "the need for liberty and democracy for all workers and all people." 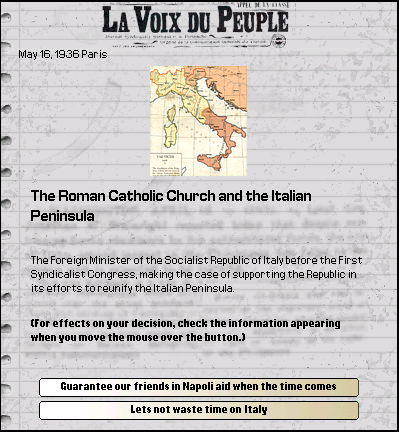 Meanwhile in Italy, the election of a new Pope led to the government of the Socialist Republic Italy to officially condemn the new Pope. In turn, Pope Pius XII issued an encyclical against Syndicalism, which also in turn, led to the SRI to confiscate all Church Property. 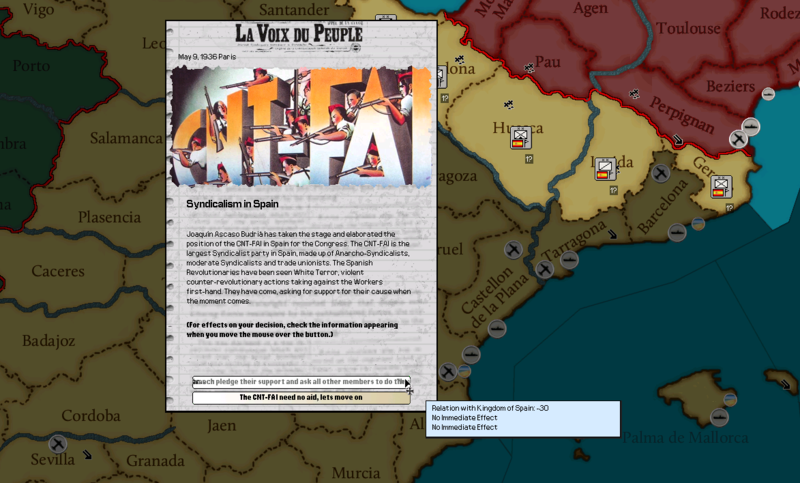 The CNT-FAI in Spain is large and popular, especially since Black Monday. As Spanish landowners began to crack down on any CNT-FAI activism, the organization has officially asked for help from the Socialist countries of the world. 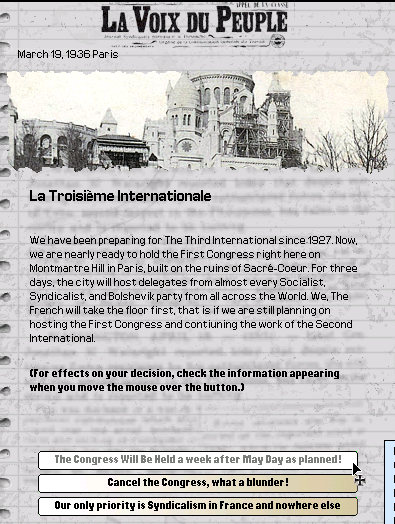 The French delegation is unanimous in its support for Spanish Syndicalism. And the same thing is happening in America. 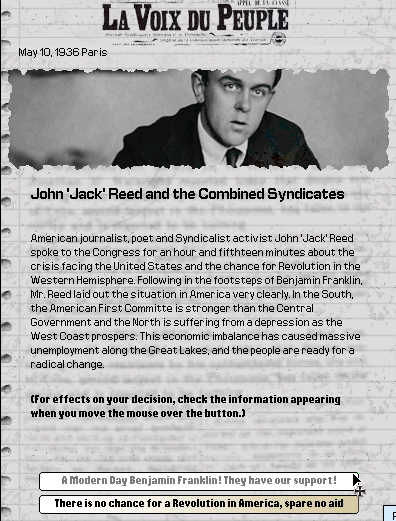 The journalist who experienced the Revolution in Russia firsthand, Jack Reed is a popular figure that every socialist in France can appreciate and support. The French Delegation is also unanimous in support of the Combined Syndicates. The Socialist countries of Centroamerica and Mexico have experienced large amounts of growth and success since their revolutions, and the effects of Black Monday had made Syndicalism in Latin America even more popular. 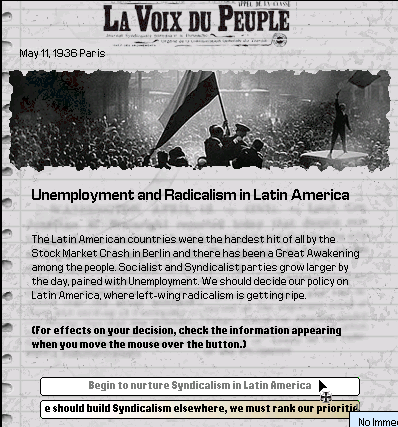 And as the face of Syndicalism, France must support it in Latin America as well. 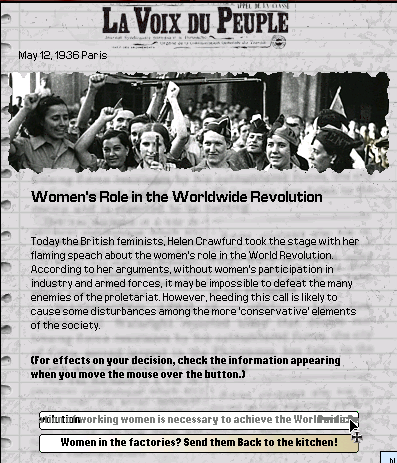 Helen Crawfurd, British socialist and Feminist, gave a rousing speech to the Congress. She declared that women must have a completely equal role in regards to Syndicalist governance, ending her speech with, "Women hold up half the sky!" 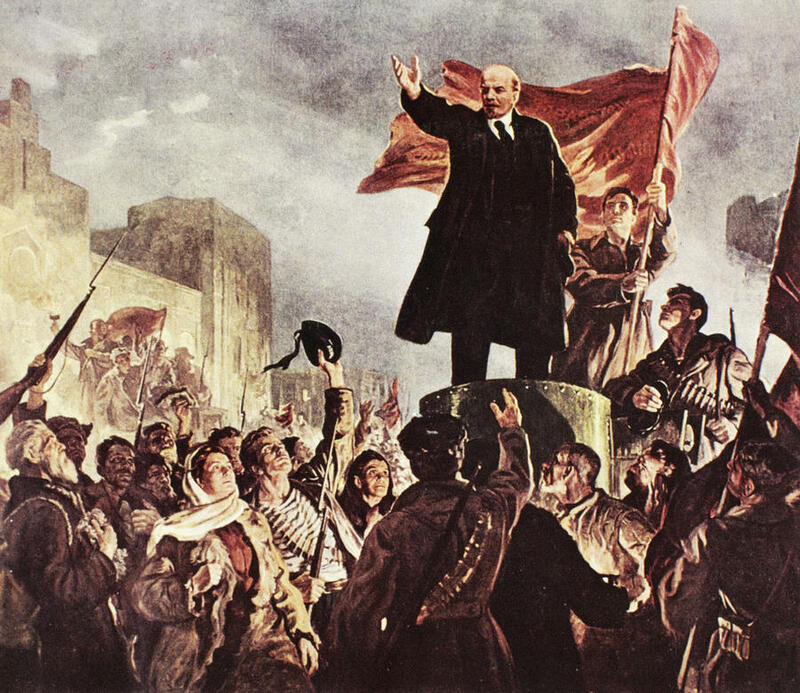 All across the world, capitalist countries have cracked down on Socialist movements, and in many cases, the Social-Democratic Parties helped, as they denounced the revolutionary tactics of the Radicals. Overall, the Congress comes to the conclusion that the Socialist movement must denounce the capitalists and the Social-Democrats. 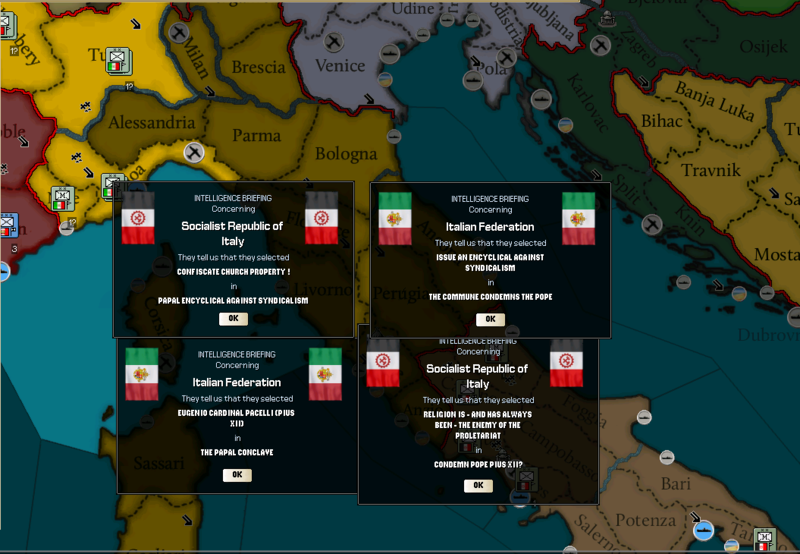 On May 16, the government of the Socialist Republic of Italy contacted the Communard government, asking for an assurance that the Communard government will support the forces of the SRI if it comes into an armed conflict with the Federation. The Commune agreed. The Catholic Church in the Commune is officially independent of any government control, as long as no Priest decides to call for the armed destruction of the workers' state. 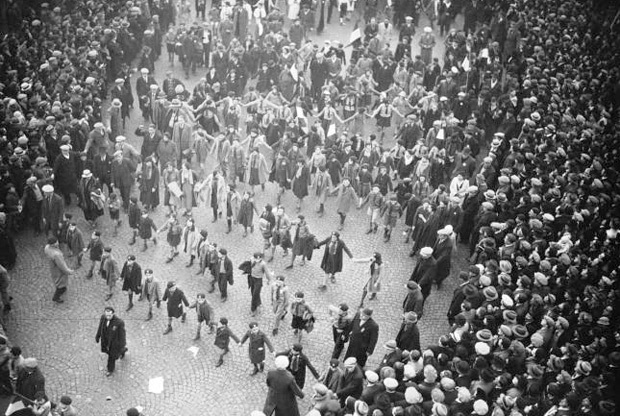 In an obvious response to the denounciations of countries such as Germany, the German Government announced a ban on the Free Workers' Union of Germany, with many of its leaders being arrested. In a similar move the Pivert government, Thorez's government does not feel it is the right time to confront Germany. Divided India as of 1936 is a bomb ready to explode at any moment. The Bhartiya Commune (the legitimate government of All India according to the Commune of France) is not exactly militarily-ready. As such, they begin to send out requests for French and British military advisors. The Bhartiyan government is made up mostly of left-wing "national liberation"-ists, believing that India obviously has a right to be ruled by the people of India. The Bhartiya Commune has a chance to become a large, Socialist power in the East. 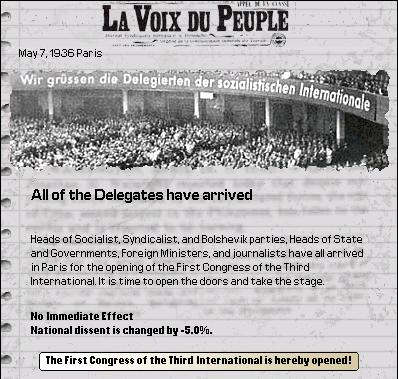 On May 19, 1936, The First Congress of the Third International officially ends. The International Socialist Line has evolved and advanced tremendously. Form up for the attack.